The food truck revolution has made lunch a lot more tasty for millions of office workers in cities all over the world. 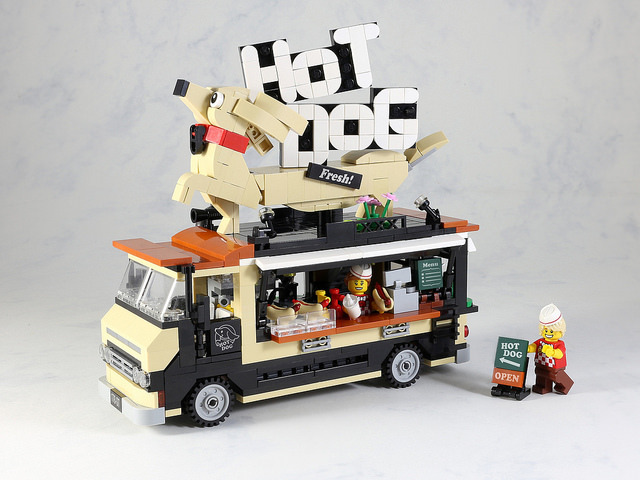 LEGO 7 brings us a delicious LEGO version of a hot dog truck, complete with brick-built lettering and a noble dachshund statue gracing its roof. 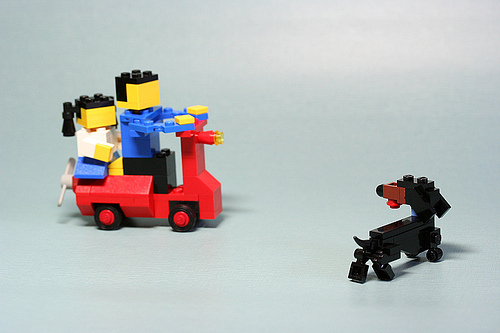 2018 is the Year of the Dog, so I’ve been enjoying all the extra LEGO creations inspired by our canine best friends. There are even couple new dog-themed LEGO sets, like 30542 Cute Pug and the upcoming 40235 Year of the Dog, which seems to depict a Shiba Inu. Taiwanese builder ZiO Chao has captured the quirky personality of the miniature dachshund with this black and tan beauty. ZiO has built an unmodified male dachshund, as this view of his business end illustrates. That tail looks ready for the show ring! The Olympic Games of 1972 in Munich, Germany were the first to feature a mascot. 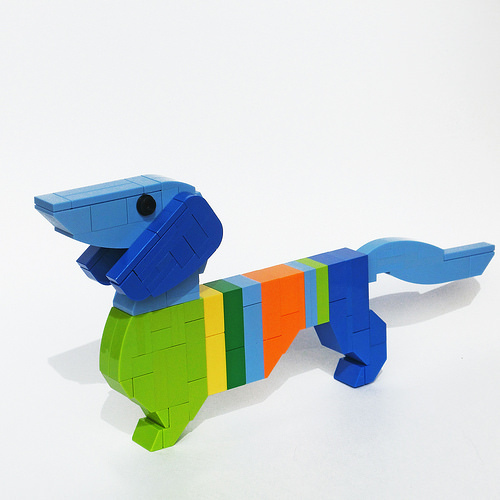 Waldi the dachshund was designed by graphic designer Otl Aicher, who modeled Waldi after a real-life doxie named Cherie von Birkenhof. Even in this simple but excellent LEGO version of Waldi by umamen, you can see the attributes of resistance, tenacity, and agility. aurore&aube‘s favorite set of all time is the small 1976 set 212 Scooter. He celebrates this classic set by recreating it in Miniland scale. My favorite detail, though, is the extra black-and-tan dachshund that aurore&aube included. Making small-scale LEGO animals is especially challenging, though aurore&aube is no stranger to excellent LEGO creatures. The dachshund stands in an expressive pose, as though he’s about to start barking at the passing scooter. 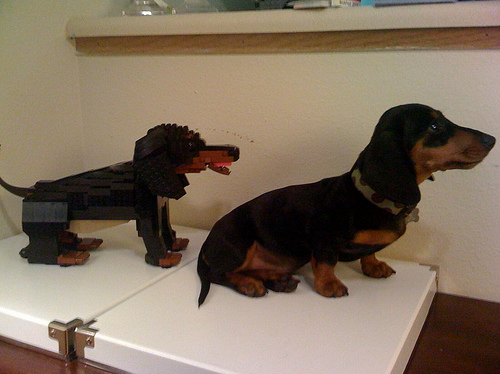 The miniaturization of LEGO dachshunds continues. 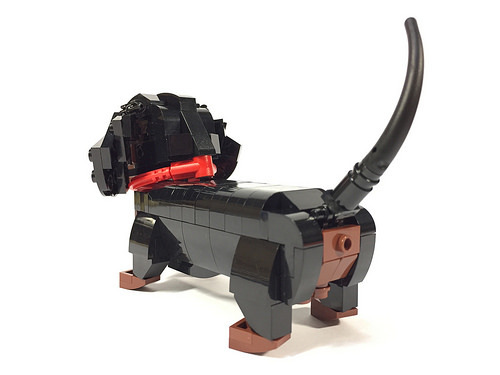 Brickshelfer w9gfo recently posted this lovely little dog, completely with lolling tongue. Here’s hoping Joel’s puppy enjoyed this post as much as Josie did. 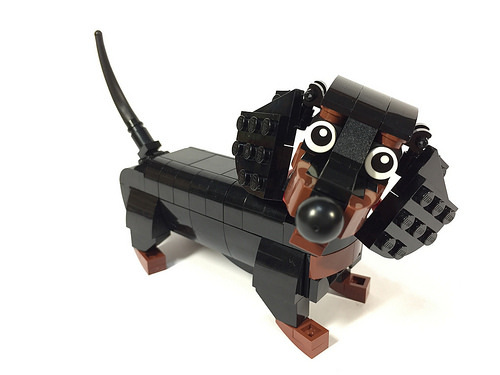 With Josie sitting next to me while I eat cheese puffs, I would probably be licked into submission if I didn’t blog Joel Baker‘s adorable pair of dachshunds — one real, one LEGO.